Home > NSX > NSX vs R35 GT-R size comparision. I get this from Jalopnik which says they got it from i-Club. I know the pics came from Steve Mitchell from M-Workz or Billy Johnson. Pretty sure thats Billys NSX. I was talking a little smack to him when he was over. I actually really like the NSX. Back in 1991 when they came out, I had the opportunity to drive several of them. Great shifter, awesome clutch, great visibility. I never took it anywhere than up and down the street, so I can't make any real comments on handling. I was 16 years old then also, so anything I thought then, probably doesn't apply now. The R35 GT-R is one of the cars that I helped Steve with . 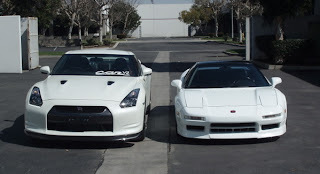 The R35 GT-R is big, or the NSX is small. Maybe both.